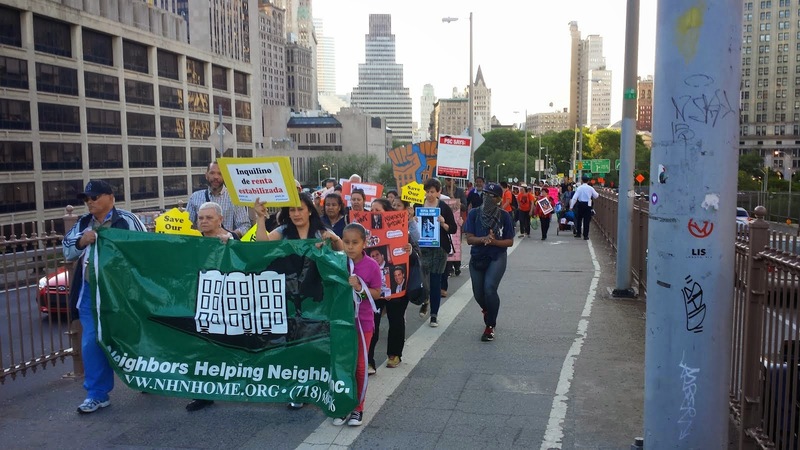 Thousands of people from a full range of ethnic and economic backgrounds marched over the Brooklyn Bridge on Thursday evening, May 14, calling for, in the words of a newly elected Assemblywoman, "real affordable housing" in New York City. Community leaders, tenants associations and residents from Crown Heights, Flatbush, Park Slope, Sunset Park, Williamsburg, and other parts of Brooklyn, as well as from neighborhoods in Queens, Manhattan, the Bronx, and even as far as Westchester, met at Foley Square in Manhattan to air their grievances and make a case to strengthen rent regulation, which is set to expire on June 15. The debate over affordable housing has spilled over into state politics. Senate leader Dean Skelos and former Assembly Speaker Sheldon Silver are accused of improper conduct for accepting donations to their campaigns from large real estate companies allegedly in exchange for favors. The developers were lobbying in favor of 421-a, a tax break to developers who build affordable housing. It's worth mentioning that in 2007, the New York Times reported that then-Governor Elliot Spitzer was going to repeal 421-a, a few months before he resigned in disgrace in an unrelated prostitution scandal. 421-a was created in the 1970s to promote development in New York City at a time when high unemployment and crime scared off developers. Between 1970 and 1980 the city experienced the greatest loss of population in its history, dropping from its signature 8 million residents in 1970, down to 7 million by 1980. By 2010 the population exceeded 8 million, coupled with a massive drop in crime, while affordable housing apartments continued to be phased out. Today, housing advocates contend that 421-a should be abolished and the money instead go toward building affordable housing. Long-time residents who fought for years to clean up their neighborhoods feel betrayed as they're slowly priced out of their apartments. Luis Arrocho was born and raised in Park Slope; he moved to Sunset Park 14 years ago because he couldn't afford the rents in Park Slope. Now he says he's probably going to have to move again. "The building I used to live in now has rents from about $2000 to $3000," Arrocho said. "If things continue people will be displaced. My sister is still living there and her rent is rent stabilized, it's $900. My sister is struggling just to stay, she is a single mother and has a disabled child," Arrocho says. 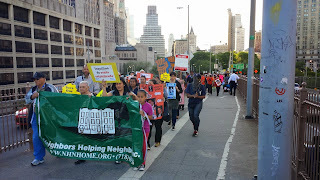 Arrocho has since become a tenant organizer for the National Alliance of HUD Tenants (NAHT) and works with Neighbors Helping Neighbors, Tenants United, and other such organizations. He also trains and organizes tenants for housing rallies, like the one he plans to attend in Washington on June 20. "What's going on in Sunset Park is that they're gentrifying the neighborhood, " he said. "Industry City is putting a lot of money. They hired a lot of people, selling the houses. Once they're vacated they fix up the houses and raise the rent. My rent was $1300, there are some paying $1500. We hope that the politicians will hear our voices for affordable housing, because the rents are too high." "The image in our town is a suitcase with wheels, furniture piled up on the curb and a moving van." New York City Public Advocate Leticia James echoed the sentiment, telling the crowd in Foley Square that she had just spoken to a woman from the Bronx who told her she is one rent-increase away from living on the streets. "She lives on Social Security and her pension is not going up, so she could not afford any more increases," James said. "Here's a woman who's lived in her apartment for over 40 years. We can do better than that as a society." James was one of the many speakers who used an example of homelessness to support strengthening city rent laws. Statistics by several agencies report that over the past 10 years. homelessness has increased 70 percent -- to 60,000, of which 22,000 are children (a surge that began after 9/11). Of those 60,000, about 60 percent are African-American, 30 percent Latino and 10 percent white. James praised Mayor de Blasio for appointing New York Attorney General Eric Schneiderman to head an anti-harassment task force aimed at landlords who try to force residents out of their rent-controlled apartments, and for helping tenants get legal counsel. "It's up to Albany to protect tenant, to end vacancy decontrol, eliminate the vacancy bonus, to respond to the needs of New Yorkers and stop tenant harassment," she said, adding that the Urstadt Law which took away New York City's power to pass rent-control laws and gave it to the state Legislature, should be repealed. "Upstate Republicans should not be regulating our rents," she said. "Rent regulations give a family security, allowing them to climb the economic ladder. It strengthens the middle class and provides us with diversity in the city." James also criticized laws that allow landlords to raise rents permanently after making major capital improvements. housing advocates contend that once the improvements are paid off, the rent should go back to its original level. Manhattan Borough President Scott Stringer said he had commissioned a report on affordable housing and found that 400,000 units that rented for $1,000 or less had disappeared over the last 12 years. "If we don't do anything to improve rent regulation, then this city will be lost to the next generation that comes here to build a life and a community," he said. "We cannot allow the speculators and developers to push the people out who built up our neighborhoods." Newly elected Assemblywoman Diana C. Richardson, the state's first person to win a seat in the state legislature solely under the Working Families Party, said she won her district of Crown Heights by running on the issue of housing rights for the working poor and middle class. "I fought against irresponsible development, and in my campaign I did not accept one penny from developers," she said. "This race was a referendum about the role of real estate and its role in Albany. Their interests walk through all of the halls of Albany. My win shows that the power of the people can still beat big money. They don't own New York City, we do. This win is a mandate to build REAL affordable housing and to make sure that working families can make ends meet." 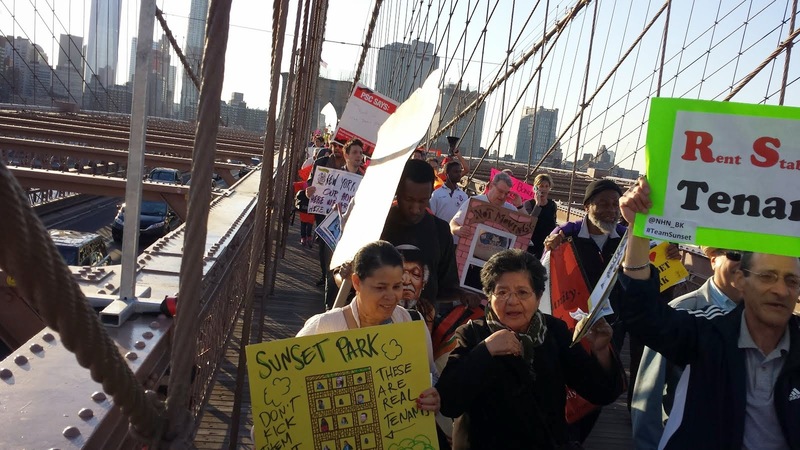 The Metropolitan Counsel on Housing warns that if rent regulations fail to pass on June 15, some 1 million rent-stabilized apartments will be at risk. The MCH is pushing to repeal vacancy deregulation, which allows landlords to remove apartments from rent regulation upon vacancy when rents rise over $2,500. The MCH reports that this law has deregulated more than 300,000 apartments. Rents there have risen indefinitely, and tenants have lost protections against eviction. Brooklyn Councilman Jumaane Williams, who chairs the City Council's Housing Committee, stressed that the City Council has tried to strengthen rent-regulation laws, but the Council's power has been limited by the state Legislature. At this point, the only person who in effect can guarantee that working poor and middle class families remain in affordable housing is Gov. Cuomo. "I want him to hear us: We will remember!" Williams said. "All of these issues go together. Police reform, 'Black lives matter,' 'Poor people matter' – all of these are one issue and it begins with housing. Because if you have no place to live, what are you going to do? So we need the rent protections, we need affordable housing, which begins with rent regulation." With that, the members joined the thousands of protestors as they marched over the Brooklyn Bridge to Cadman Plaza Park. Coming toward them over the bridge were hundreds of curious tourists who snapped pictures of the marchers with their iPhones, no doubt wondering about this uniquely New York multicultural crowd holding banners, blowing horns and banging on buckets chanting… "The Tenants United, Will Never Be Defeated!"